Robo-pigeon looks like something out of Herbie Hancock's "Rockit" video! I'm here for the secrets of pigeon dating! @james the same kind of creepiness (though that video is pretty great)!!! @rbrt ... or pigeon's non-dating. I have been test-flying a mix of 70s/80s synthpop up until now but it's almost time for the Vertigo! hey fred how's it going? Hallos, my radio family fred! Hi coelacanth∅! Thanks for tuning in! Hey there Mayuko and listeners! Hellos Dropof! Hope your Saturday work is going well! Well... It's going. Let's leave it at that. haha Thanks! Hey Claudia! Thank you for tuning in! I have a lot to do today so I will probably go back to my quiet self. I am listening! @Dropof if at least it's going then better than not going... I guess??? good luck & thanks for your ears! Even though I'm streaming but you know what I mean. At least it's radio 'sound' waves!! Are you sure those around you are "real" ones and not robots as well, fred? Hey Dave!! How are you and your blue jay neighbor? Pigeon dating? Oh. Weird. We were just talking about Renaldo and the Loaf yesterday. Hello!! Hey Alessandro, and rw! Thanks for tuning in!! We cannot discuss critters in NYC without Jake. Yeah. Pigeons are ubiquitous but can be like humanity: Charming and nasty. I’ve seen so many pigeons be legit nasty I now consider sparrows the only kind and decent city bird. @fred yah! that was some nice find in the new bin at the mothership! Hey Amelia! Thanks for tuning in! Chris and Cosey! I'm showing my age! So much thuggery in the pigeon society. Wow. Jake, you really are the NYC critter expert! That dog video is pretty great. is Mayuko going to rap? Aaaahhh, so great to actually hear this Hancock! Yes! I've never heard an FMU rapping mic break. Hello DJ Mayuko and Vertigonsters. This is likely the first track on which I heard scratching. Likely, thru its MTV airplay, this was true for much of America. that's a good point what the hell does a pigeon baby look like! Venice Italy a big pigeon town too. Hi, Mayuko and Mayukolodeons. The primary birds here at my mom's are barn swallows, growing fat on mosquitoes. Also blackbirds and some hawks, ducks & geese, but not a single meadowlark. Sounds like my high school years. Only baby squirrels have seen baby pigeons. Has everyone seen the lady with the Pigeon Shoes that are getting so much attention? those bully pigeons woudl attack her feet! Enjoying this very much. Hello, Mayuko and listeners. ah I see why now you guys were asking if I were going to rap. I changed my mind from mic break to play Rockit there as literally a last second decision, haha. thanks to James! I've seen a flock of felt pigeons in Brooklyn before. With a felted slice of pizza. When you walk down the street and sometime hear weird squeaking from store awnings? Those are baby pigeons. Hello, Mayuko, the vertically fine, the horiztonally challenged, the 4th dimensional overseers to whom all praise must be directed, and all not in any of those sets. Welcome on board P-90! Glad to hear I'm doing a good job offering an alternative listening option! Ah, very cool, @JakeGould; thanks. I go with everything, @Rickwaukee. I think the first Hannibal Burress bit I ever heard was him talking about kicking pigeons. 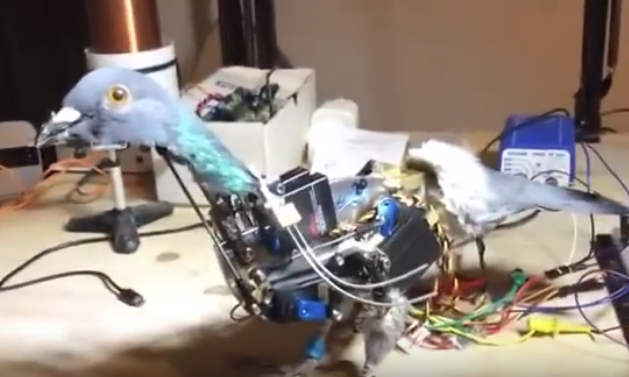 Now that I am logged in, I must say that robot pigeon is really disturbing. Glad you're digging em Amelia!! Checking out of the playlist but will be listening in the other room. Thanks Mayuko! Later kids! Have a great weekend everyone! Thank you for your kind words, Peter Aitch!! Great weekend to you too rw, thanks for listening!! Gotta go outside myself! Will be sure to keep an eye out for city animals doing things as I usually do. Thought there was flood warning around us, Jake? Is it over? Hope you'll enjoy outside anyways! where do the pigeons go in torrential rains? I love the title " Broken Hearted Ragged and Dirty too"
@rbrt the perfect description for pigeons. Broken hearted because the lady pigeons aren't impressed! @fred Solidarity Solidarnosc? I got it at our library in JC, so I don't have any booklet to check at hand. @Rickwaukee They stay in this horrible full-blast 60F ACs that seems to be everywhere in NYC? They're def tougher than I am! my pigeon story. i was once sitting on my steps polishing my boots on a summer evening when a mother & 2 children came up my walkway with a pigeon in a box. they claimed they thought i was a doctor, i think. (their english wasn't great) pigeon was holding it's head upside-down. couldn't fly. i fooled around with it a minute but didn't know what to do. so i took it to the raptor trust in millington,nj. not a raptor but i'd been donating to them and thought they'd help. the vet took the bird's head, turned it upright and said there's nothing structurally amiss; the bird probably flew into glass and now saw everything upside-down. i think that pigeon became hawk food after that. There's no mistaking a Stephin Merritt joint! Did Stephin Merritt write this? I love Wasps' Nests. @Rickwaukee yes. Hello Mayuko from a wet UK. Very refreshing. @coelacanth∅ the pigeon could have sent back to the manufacturer, but maybe its warranty had been already expired. Hi thanks for listening, dougseidel! @coel: it was just pining for the fjords! Thanks Fred, I'll check it out. Hi Brian! Brooklyn was more than wet this morning too, it was flooding it seemed. A lot of good stuff today. I'm going to have to go back and give it a listen on the archive. When the White Eagle of the North is overhead. (make sure you have an umbrella to hand) Moody Blues joke? Wait... there's always a lot of good stuff. What I meant was, I haven't been able to listen in front of the computer so I need to go back and piece things together! Is Tokyo the most populous city in this world? Thanks, Mayuko. I trust no Clay Pigeons were harmed during today's recording. Real pigeons are now very rare and worth quite a lot of money. What? over already? This show isn't long enough. Thanks Mayuko! maybe the veterinarian knew they are robots and didn't want to disclose that to me at the time. i like pigeons, as long as i call them doves. Have a great week Mayuko and everybody! The two-fastest hours of every week. Thanks, Big M Bird! Keep well - in the cold - like an lovely egg. @Paul b haha love that pelican story! Pelican is such a strange bird. During the Second World War, pidgeons played an important part in communications. Homing pidgeons that is. Thanks again everyone for listening and kind commenting!!!!!! See you next week. Ah! Thanks for re-listening coelacanth∅!